DUSTY loves the desert. It is clean, pure, unforgiving, and always full of challenges. 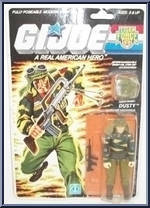 Dusty was working as a refrigerator repairman and studying desert ecology at night when his pre-enlistment application for the G. I. Joe Team was approved. He took Basic at Fort Bliss in Texas and loved every minute of it. When Tiger Force was in need of a desert combat specialist, Dusty wasted no time in signing up for it! "It's not enough nowadays to have a rapid-reaction force able to respond instantaneously to explosive situations in far flung corners of the globe. That force must be capable of surviving in a diverse array of hostile environments to accomplish its objectives. If the Tiger Force team was confronted by a numerically superior Cobra battalion, Dusty would hop on the Tiger Paw and automatically take the point to spearhead the counterattack!" Contribute pictures, update details or suggest corrections for Dusty. Write a review about Dusty.